Although he is Sevillian by birth, he was raised and lives in Córdoba, where he attended his first guitar lessons with El Tomate and Merengue de Córdoba, and later, he improved his guitar playing with Manolo Sanlúcar, with whom he worked for ten years. After a period of accompaniment which began alongside El Pele, he started to devote himself almost exclusively to playing concerts in 1988. De Mi Corazón al Aire (“From Out of My Heart”, 1991) was his first record. An admirer of Paco de Lucía since childhood, Amigo took part with him in the show “Leyendas de la guitarra” (Legends of the Guitar) that was held in Seville as a foretaste of the Expo 92 exhibition, which also featured Paco de Lucía, Bob Dylan, Keith Richards, Steve Vai, Joe Satriani,Nuno Bettencourt, Phil Manzanera, Joe Cocker, Jack Bruce and Richard Thompson. By that time, he had already been awarded some of the most prestigious flamenco guitar prizes. 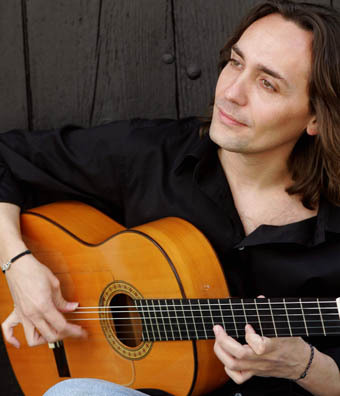 Vicente Amigo is open to experimenting, pursuing Flamenco to unprecedented limits, and gaining in-depth knowledge about other forms of music, and sharing experiences with other artists. He has taken part in recordings by Khaled, Miguel Bosé, Carmen Linares, Manolo Sanlúcar, Wagner Tiso, Rosario, Nacho Cano, Alejandro Sanz, Sting, etc., and has shared the stage with the greatest of contemporary artists: Paco de Lucía, Stanley Jordan, John McLaughlin, Al Di Meola, Milton Nascimento. Posted in Acoustic Guitars, Classical guitars, Flamenco guitars, guitar, guitar music and tagged Alejandro Sanz, best flamenco guitar, buy classical guitar, buy flamenco guitar, classical guitar, classical guitar music, Flamenco, flamenco guitar makers, Flamenco guitar music, John McLaughlin, Manolo Sanlúcar, Milton Nascimento, Nuno Bettencourt, Paco de Lucía, play flamenco guitar, Seville, spanish flamenco guitar, Vicente Amigo. Bookmark the permalink.